When in the course of human events, it becomes necessary for one bookseller to dissolve the economic bonds which have connected her with a bookstore, and to assume among the community of booksellers, a separate and equal station at a new establishment, a decent respect to the opinions of blog readers requires that she should declare the causes which impel her to the separation. 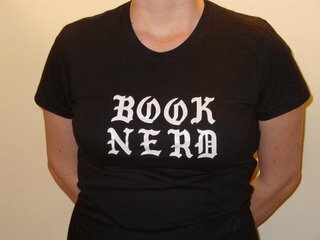 Yep, it's true -- your Book Nerd is changing her place of employment. To be precise, I'm leaving this store for this store. It's been an intense couple of weeks, but obviously I didn't want to post the news here before I'd made it public with my employer and coworkers, which just happened yesterday. So what are the impelling causes? Primarily, the pursuit of becoming a better bookseller. As you all have seen me declare repeatedly, I'm after a store of my own, and I'm interested in experiences that will prepare me for that eventuality. The store I'm going to is relatively young, still finding its niche in the neighborhood and its groove in terms of staff, stock, systems, etc. They've done some fantastic things so far -- created a beautiful space, initiated a stellar event series, begun to build a reputation as a source for a wide range of quality literature -- and I'm excited to get involved there at this stage and get a chance to learn about the process of becoming a great neighborhood bookstore. I have no interest in burning bridges, and I've learned a great deal about various aspects of bookselling at my current store, including a ton about effectively managing bookstore staff. But I feel like maybe I've reached the limit of my learning there. I won't be a manager at the new place -- their staff of booksellers is too small to require one, though everyone has manager-level responsibilities. To be honest, I'm looking forward to taking the focus off of supervising employees, and getting back to the books and the customers. Hopefully I'll be able to re-sharpen my handselling skills. And there are at least half a dozen aspects of the store's operations that I'm itching to get involved in -- the owner and employees assure me that my interest and passion will be welcomed. I'm starting the new job on the first day of spring. I can't think of a better symbol for fresh beginnings. Goofy Declaration of Independence references aside, I feel on the verge of a revolution.